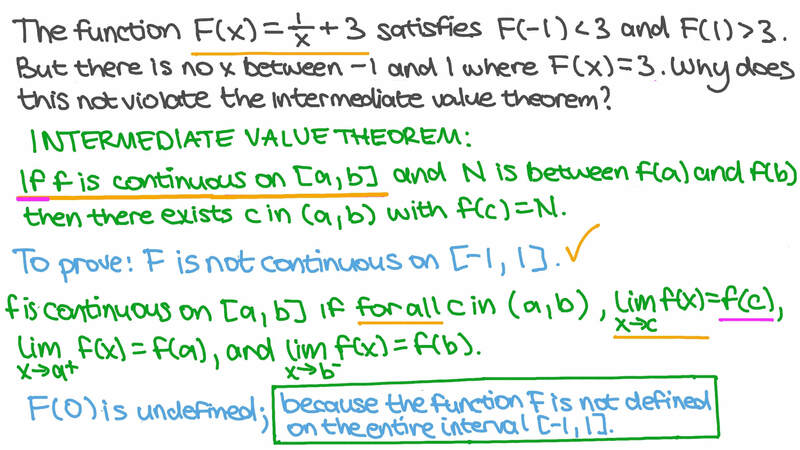 In this lesson, we will learn how to apply the intermediate value theorem. The function 𝐹 ( 𝑥 ) = 1 𝑥 + 3 satisfies 𝐹 ( − 1 ) < 3 and 𝐹 ( 1 ) > 3 . But there is no 𝑥 between − 1 and 1 where 𝐹 ( 𝑥 ) = 3 . Why does this not violate the intermediate value theorem? The figure shows the graph of the function 𝑓 on the interval [ 0 , 1 6 ] together with the dashed line 𝑦 = 3 0 .
𝑓 ( 0 ) < 3 0 and 𝑓 ( 1 6 ) > 3 0 , but 𝑓 ( 𝑥 ) ≠ 3 0 anywhere on [ 0 , 1 6 ] . Why does this not violate the intermediate value theorem? The function is defined on the interval and is continuous there. It is known that and , and these are the only values of with . It is also known that . Explain why . The figure shows only a part of the graph of the function , which is defined on all of . If we say that for every , what can we conclude about ? Why? BNo conclusion is possible with the information given. The figure shows only parts of the curve . We know that the function has the following properties: , is continuous, , and . By considering the difference , what can you conclude about this function? AThere must exist a point such that . BThe function is zero at some . CThere is no conclusion possible. DThe function has an inflection point somewhere. EThe function takes the value 0.4 at some point.